← Moving Teenagers- Are You Up To It? So I must admit. Spouse and I started our indoctrination trip in Vancouver for purely selfish reasons. I haven`t calculated exactly how far Vancouver is from Montreal but give or take 4,889 km or 3,037 miles would be a good close guess. This is the exact distance we want between ourselves and a college bound freshman. Anything remotely driveable means said Offspring could show up unannounced at an inconvenient time, hungry,toting a mildewed pile of laundry stuck together in a garbage bag. We were really going to sell Vancouver and it`s stellar universities hard. For those of you just tuning in, we started with the Capilano Bridge. (read here) Just a warm up to the remaining festivities. All of you with teenagers- or those of you who have been teenagers, or still act like them- know that the choice of a University really has nothing to do with academics. In Offspring #1`s case, it boils down to one clear and firmly set criterion- is it a snowboarding location? A little different from his best friend`s-who maintains the perfect college is one where he never has to wear long pants. Spouse and I had to prove Vancouver was up to the challenge. This was our guiding principle in activity planning followed closely by another topic important to teenaged boys- food. We began with the hard sell. Miku Restaurant on the Waterfront. We knew we were in the right place when we heard real Japanese being spoken from the open kitchen. I showed off my mad Japanese skills immediately setting off a cacophony of complaints from the Offspring begging me to stop. Since having children isn`t a money-making operation and you`ll never recoup the investment, make yourself feel better by embarrassing them at every opportunity. It`s also a great pay back for when they get caught drinking. I jabbered on in my unintelligible Japanese while the chefs nodded politely. They were trying to decipher the language I had chosen to speak. The food was great and OS#1 ate much more than we could afford. The next day was dedicated to convincing OS#1 that Vancouver has the best snowboarding ever. The lack of snow was a minor distraction easily overcome by the teen friendly activities planned. The best way to learn the topography of a mountain is via zip line. We`ve all zip lined before and I would rate it a 3 on a 10 point scale for fear factor. As we got closer I started to get a little apprehensive. 200 meters above the ground? How high is that exactly? 50 mph? I was comforted by the constant landing of the fire helicopter on the pad located directly next to the first launch site. At least we would be air lifted to a hospital. Our first ride was a warm up. I still managed to squirt a drop or two of pee on the crowd below. The zip line then transitioned from fun to vomit inducing. Our instructor prepared us. “This goes fast and is a little rough on the other end. You`ll see the big red bag at the end of the line. You`re going to hit it- hard- and you`re going to be going fast. As soon as you see the red bag, tuck your chin to your chest and keep it there! Otherwise, it will hurt REALLY bad- and for a long time after.” Spouse and OS#1 went first. All I saw was a huge puff of dust and pine needles accompanied by a sonic boom when they hit the bag. S&'(t! But if you want to evaluate the snowboardability, one must get a lot higher than a few feet off the ground. Luckily there were no people below when I took on the zip line 20 stories above the ground. (Although exaggeration prone on occasion, this was not one of those times. Swear.) Body fluid from every orifice rained down on the pristine landscape below. My poor babies would be crying for me when they got to the platform. OS#1 beat OS#2 to the platform in a race across the ravine. This brought on several minutes of heated debate regarding the advantage of body weight vs ability to become stream lined in a zip line race. (Which must be a highly paid professional sport based on the heat of this debate) That ended when I produced the duct tape I carry with me at all times to end these endless squabbles. The snow and pretty girls were taking a break while we were there. According to their current chalet cam shots, it`s not quite the bee hive of activity I promised OS#1. No matter, I`m sure the co-eds are studying for mid terms right now. Because snowboarders and trick skiers are an academic bunch. The second part of our Vancouver sales pitch involved proving the closeness of Whistler. We pointed our rental in that direction with our novice driver at the wheel. I`ll describe that hour and a half next time….I think I`m getting short of breath just thinking about it. 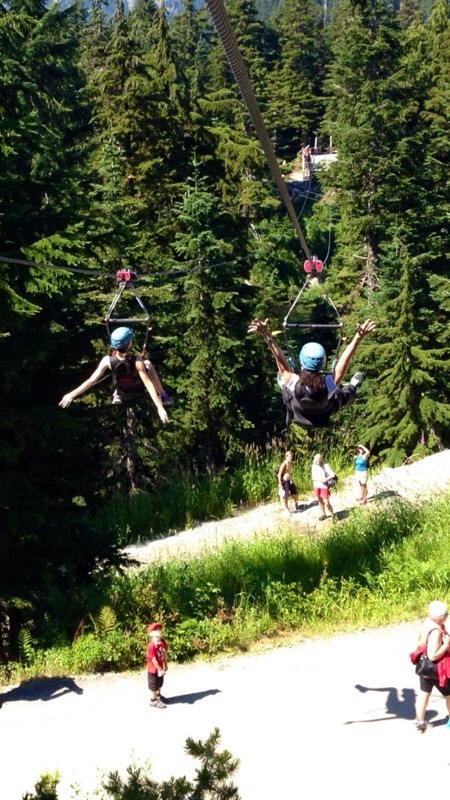 This entry was posted in Canada, Uncategorized and tagged Amblerangel, Children, Culture, Emily Cannell, ExPat, Grouse Mountain, Hey From Japan- Notes on Moving, Humor, Moving, Offspring, Travel, Vacation, Vancouver, Zip Lining. Bookmark the permalink. We still find it funny that Vancouver was able to host the Winter Olympics. Yes, there is snow in Whistler, but it’s pacific coast “snow” as opposed to real snow. More like slush. A lot like rain at times, too. Maybe this is what drove you guys to check out Alberta next? If OS#1 goes to university in Calgary, he can snowboard in Banff, Lake Louise, Kananaskis, etc. He can even snowboard at the (super lame) Canada Olympic Park, which is right near U of C in Calgary and is open year-round (winter for winter sports, summer for mountain biking and the like). I get a little cranky when I think about Alberta for many reasons (mostly because I grew up there and this gives me a right to find fault with it). Even still, for anybody who loves winter sports, Calgary is the best Canadian city to live in– just an hour away from the Rockies, but you still get all the perks of living in a big(ish) city (1 million+ ppl). Besides, Calgary gets chinooks in the winter– warm breezes that melt the snow in the city and make everyone forget about the ongoing pain of minus forty degrees plus windchill. I lived there for 26 years. Hit me up if you have any questions about the city! You`re response truly shows your tremendous love of Alberta! Haha. My Dad is from there and we spent many summers battling the epic mosquitoes! AND I hear this is where the true winter hits!!! At that point I would have had it coming out both above and below. Yikes! We just got back from there- this time it was snow filled. I cried when I saw where we went. Terrifying. I`ve grown feathers in my old age. I think it went from squirt inducing to vomit inducing, and I’m officially a giant fan of this blog! Hey Eve! Thanks for tuning in! I`m getting up to my Canada posts….. Hold on! I`m really interested in sending my kids WAY FAR AWAY! And I too have younger, hipper sisters. Damn it. We probably taught them that and then they improved upon it. So glad you are enjoying! Thanks for stopping in Gede! I went to Vancouver couple years ago, and really enjoyed the views, people, and atmosphere there. I just graduated from junior high school at that time, and was looking for somewhere to purse higher and better education. Although America has a competitive educational system as well as outstanding colleges, what come to my parents’ mind was the safety issue. So we chose Canada instead. When I visit there, I went to Columbia Ice-filed, several national parks, and some famous colleges. Compared to America, people there lead a slower pace life. Even though I came to the State at the end, I still think Vancouver is definitely a good place to live and study. So so true. We were just amazed at how few people we ran into- of course the population is much smaller. A lot of Japanese kids would go to Canada vs US due to safey. I can understand it- sadly! Sometimes when selling doesn`t work I resort to arm twisting…. Happy New Year Sweffling!